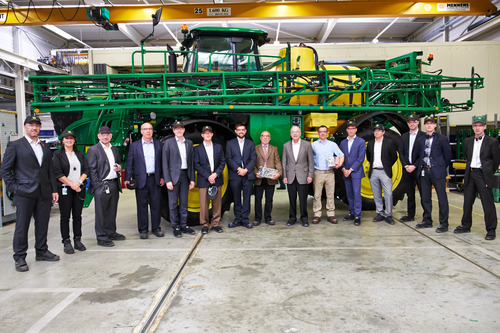 Thursday was spent in the Netherlands reviewing John Deere Fabriek Horst operations and the sprayer product line. The unit has made tremendous improvements in the sprayer line’s business performance while also improving the quality and reliability of its products. While there, we had a chance to talk with Richard Salmon, a customer from the U.K., about his John Deere self-propelled sprayer. Richard, who farms more than 9,000 acres, admitted he had some issues with the product during the season. But he said the Horst factory and our U.K. dealer (Farol LTD, represented in Horst by Jeff Richings) made sure the problems were corrected early. That is one of the reasons he has already ordered the first production unit of our new 4040i Sprayer that will be introduced in February 2015. It’s a great example of the importance of our partnership with the dealer in taking care of the customer when they experience a problem.